Martin-Kaye Solicitors is celebrating after winning a prestigious national award in honour of the work carried out by our commercial division. We've been named as the UK Small Business Law Firm of the Year in Acquisition International Magazine's Awards in the category for firms representing clients with turnovers of less than £20 million. Senior partner Graham Davies said: "This criteria in fact covers the majority of businesses in this region, so we're highly honoured to have received the top award. We were pleasantly surprised but delighted to receive such fantastic recognition, particularly as the winners are chosen through votes cast by a combination of clients, other professionals and our peers. "The complete list of winners reads like a 'who's who' of legal and accountancy professions, and I'm very proud to see us named in such illustrious company. "At Martin-Kaye, we have always maintained that businesses can find professional, commercial advice at the right price here in Shropshire, and that they don't need to resort to city-centre firms - this award definitely proves that point." The Small Business Law Firm of the Year Award follows hot on the heels of Martin-Kaye receiving impressive recognition in the independent UK Legal Directory Legal 500. Every department in the firm's commercial division was listed, as well as Martin-Kaye's personal injury and family and divorce departments. 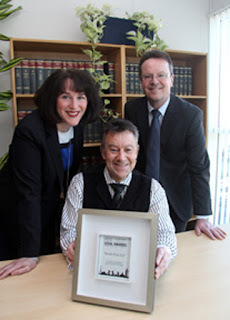 Graham said: "To receive such recognition on a national scale is a reflection of the skill and expertise of our lawyers, and for a firm of our size based in a county like Shropshire, such success is nothing short of remarkable." Jane Peter, chief co-ordinator of the AI Legal Awards, said: "Our legal awards winners are leaders in their respective fields, and our awards mean something - not only to the winners, but most importantly the people they advise. "The winners represent the very best in class at innovation, differentiation, and first class service to their clients, and we invite everyone to celebrate the legal teams that have shown the greatest strength amid ongoing global economic uncertainty."